Visalia Electric 502 at Western Railway Museum. 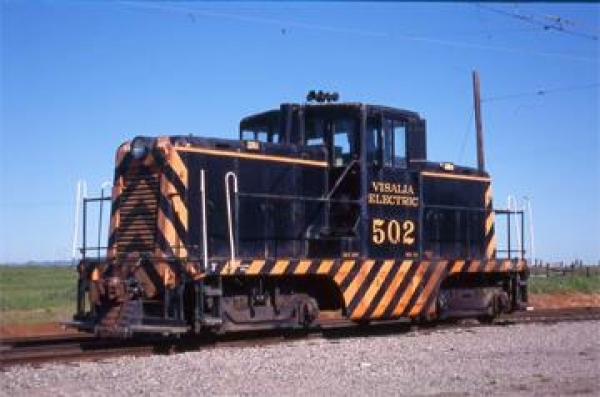 Visalia Electric 502 is a General Electric built 44-ton Diesel electric locomotive. 502 was built by GE in August 1945. It has two Caterpillar Diesel engines that drive two electric generators that power four traction motors. The reason to purchase 44-ton locomotives was the 90,000-pound rule in the 1937 labor contract with enginemen. This clause permitted railroads to operate locomotives below this weight without a fireman. 502 was one of a two locomotive series. The Visalia Electric determined that locomotive 501 was unnecessary and it was leased to the Southern Pacific in 1946 and sold to it in 1950. 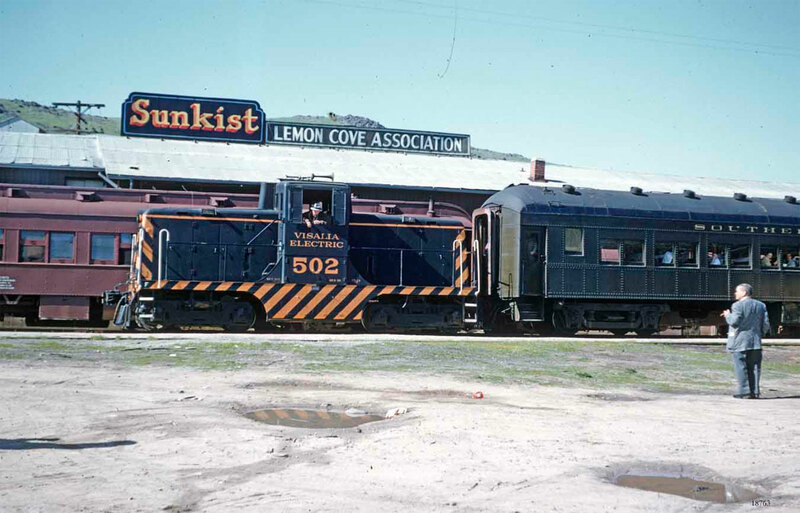 502 remained the only locomotive on the VE from 1946 until it was retired in December 1971. It was stored in Bakersfield until it was donated to the Western Railway Museum in May 1973. Technical Data: Builder, General Electric Company, Erie Works, August 1945, construction number 27818. Tractive effort, 26,400 pounds. Minimum curve radius, 50 foot. Weight on drivers, 88,000 pounds. Speed, 35 mph maximum permissible. Gearing, double reduction gear unit 11.25 to 1 ratio. Trucks: Trucks, GE fabricated. Wheels, 33” diameter steel. Air Brake Equipment: Air Brake System, 14EL. Engineman’s brake valve, K-14-F. Distributing valve, 6KR. Feed valve, M-3. Brake cylinder, 6 X 8. Air compressor, two Gardner-Denver ADS 9003. Dimensions: Length, 33’ 3”. Height, 13” 2 1/2”. Width, 10’ 1”. Propulsion Equipment: Engine, two Caterpillar D17000 V-8 Diesel heavy-duty non-turbocharger industrial engine, four cycle design, 5 3/4 “ bore. 8” stroke, 1662–cubic–inch displacement. Main generators, two GE direct current type GT-555. Exciter, two GE type GMG-140. Traction motor, for GE733-J1. MU plug, 12 pins. Fuel tank, 250 gallons. Engine cooling water, 100 gallons. Sand, 800 pounds. Current Condition: The locomotive is in good condition and is operational. Proposed Future Treatment: Currently needs repainting. Maintain its good appearance and in operating condition.